2Lt Daniel A. Shebeck (P)(KIA) - Flew as First Pilot on one mission (59). Flew on three missions as CoPilot with two other Pilots: 1Lt Jack C. Timken and members of his crew (57, 60); 1Lt James C. Nix (61) flying as substitute CoPilot for regular Nix Crew CoPilot 2Lt Campbell. Completed 4 credited combat missions on 19 August 1943 (Mission 61) when he was Killed in Action. 1Lt Paul W. Campbell (CP/P) - Was the original CoPilot on the 2Lt Daniel A. Shebeck Crew assigned to the 358th BS on 12 August 1943. Was upgraded from CoPilot to Pilot on orders dated 6 October 1943. Flew seven missions as CoPilot: With 2Lt Daniel A. Shebeck (59); With five other Pilots (64, 65, 66, 67, 70, 72). Flew nine missions as First Pilot with three different CoPilots (75, 76, 77, 78, 79, 80, 86, 95, 98) and two missions as a Lead Crew CoPilot with Major Kirk R. Mitchell (P) (91, 97. Dispatched on two missions that were non-credit aborted missions (83, 96). Completed 18 credited combat missions on 11 January 1944 (Mission 98). 2Lt Dwight W. Curo (N)(POW) - Flew on two missions with 2Lt Shebeck (59, 61) and two missions with other Pilots: 1Lt Frank H. Thompson (56) and Lead Crew Major Kirk R. Mitchell (P), LtCol Kermit D. Stevens (CP) (60). Completed 4 credited combat missions on 19 August 1943 (Mission 61) when he became a POW. 2Lt Charles W. Spencer (B)(WIA) - Flew on 19 credited combat missions with 6 different Pilots: 2Lt Daniel A. Shebeck (59); 1Lt Frank H. Thompson (55, 56, 57, 61, 64, 65, 67, 68, 69); 1Lt Arni L. Sumarlidason (73, 74); 1Lt Paul W. Campbell (75, 76, 77, 78); 2Lt Calder L. Wise (79, 80); 2Lt William C. Fort, Jr. (83). Was seriously wounded on mission 83, 26 November 1943 to Bremen, Germany in B-17F 42-3064 Star Dust (358BS) VK-L, 2Lt William C. Fort, Jr, Pilot. Was awarded the Distinguished Service Cross for his action in crawling back to his guns during a heavy German fighter attack, with a broken plexiglass nose, despite his wounds. In doing so sustained frost-bite so severe that only by the barest margin were surgeons able to save his life. For further details see: 358BS 2Lt William C. Fort Crew and Distinguished Service Cross Web Pages. T/Sgt Frank G. Krajacic (E)(KIA) - Flew on two missions with 2Lt Shebeck (59, 60) and three missions with other Pilots (56, 57, 60). Mission 60 with Lead Crew Maj Kirk R. Mitchell (P) and LtCol Kermit D. Stevens (CP). Completed 5 credited combat missions on 19 August 1943 (Mission 61) when he was Killed in Action. T/Sgt Mark E. Tudor (R)(POW) - Flew on no missions with 2Lt Shebeck and five missions with other Pilots (57, 65, 93, 95, 98). Became a POW on 11 January 1944, mission 98 to Oschersleben, Germany, in B-17F 42-5360 War Bride (358BS) VK-G, 2Lt Harry A. Schwaebe, Pilot. 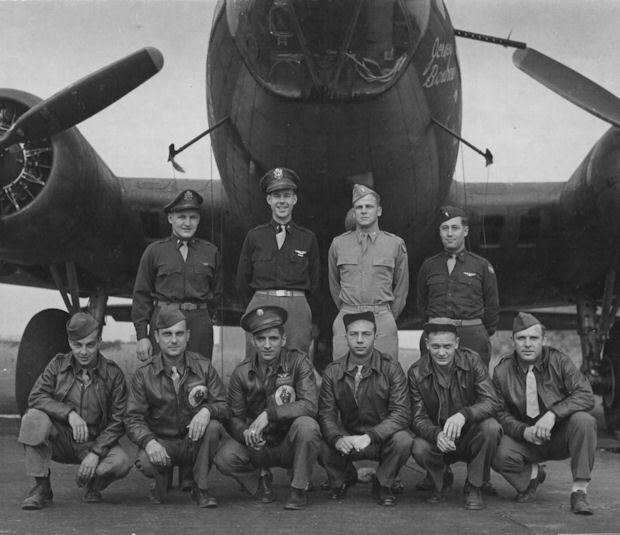 S/Sgt Frank F. Perez (BTG)(POW), S/Sgt Joseph Gross (RWG)(POW), S/Sgt George W. Buck (LWG)(POW) and S/Sgt Fred W. Boyd (TG)(POW - Flew on two missions with 2Lt Shebeck (59, 61) and two missions with other Pilots (57, 60). Mission 60 with Lead Crew Maj Kirk R. Mitchell (P) and LtCol Kermit D. Stevens (CP). Completed 4 credited combat missions on 19 August 1943 (Mission 61) when they came POWs. Mission 61, 19 August 1943 to Gilze-Rijen, Netherlands: 1Lt James C. Nix (P). Encountered meager, but very accurate flak near Antwerp. Was shot down by enemy fighters halfway between the target and the enemy coast between Odsterhout and Raamsponkvoor, Holland. The B-17 crashed near Odsterhout (4 KIA and 7 POW) - Missing Air Crew Report 284. 1Lt James S. Nix (P)(KIA) - Was CoPilot on the Capt William R. Calhoun Crew and was upgraded from CoPilot to Pilot on 22 March 1943 [See 359th 1Lt James S. Nix Crew Web Page). Was on his 22nd credited combat mission. T/Sgt Curtis O. Brooke (R)(POW). Was flying as a substitute Radio Operator for T/Sgt Mark E. Tudor. Was the regular Radio Operator on the 358th BS 1Lt Elmo O. Clark crew. on his 4th dispatched mission. 2Lt Daniel A. Shebeck (CP)(KIA), 2Lt Dwight M. Curo (N)(POW, T/Sgt Frank G. Krajacic (E) (KIA), S/Sgt's Frank F. Perez (BTG)(POW), Joseph H. Gross (RWG)(POW), George W. Buck (LWG)(POW, Fred W. Boyd (TG)(POW - All members of the 2Lt Daniel A. Shebeck crew. 2Lt Shebeck was flying as the substitute CoPilot for 2Lt Paul W. Campbell.